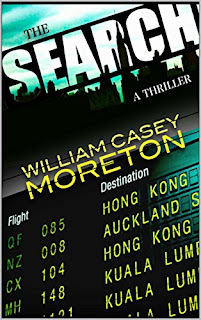 This is the first book I've read by William Casey Moreton and it was an enjoyable, easy read. If you don't expect anything too brain-taxing, you won't be disappointed. As to how believable the story is... well, not very! However, I enjoyed it and have several more of this author's books on my 'to read' list. One word of advice - don't choose this for holiday reading if you're flying! John Mabry is a wealthy, self-made man whose life takes a tragic turn when his wife's flight to Brazil vanishes over international waters. His world suddenly upside-down, he embarks on a desperate search for answers as the official rescue effort begins. As he races to find his wife, John is pursued by a cold-blooded killer when he becomes entangled in a scheme to steal millions of dollars from a New York Mafia boss. In the rush of action as the search intensifies, John’s life becomes a high-stakes guessing game of learning who to trust and who to fear.